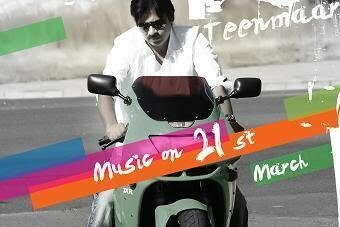 Teenmaar Music Jukebox – Play here..
Bhaskarabhatla’s pen writes about modern day youth terms like ‘shutting down egos, uploading to youtube, kevvu keka, Racha Racha, etc’. Its a hip hop song for youth, well sung by Hemachandra and Shravana Bhargavi. Especially the female voice is too good at rapping. Tune is very much similar to its hindi original ‘Chor Bazari’ from Love Aaj Kal. Gives you a retro feel with its 1970s style composition and lyrics. Must be a song in flashback. Karunya’s voice goes romantic and song makes you feel like listening to a kishore kumar – R.D.Burman track from old hindi movies. Viswa’s style of lyrics, vocals and composition can be heard in this song. Beat is an instant hit and is well combined with chorus, though lyrics don’t make much of a sense. Good for a dance number. Rama Jogaiah Sastry’s pen flows with rich lyrics starting with ‘Jagamele Sivasankara, nuvvunte maakinka bhayamendira‘. One more great song on Varanasi after Chiranjeevi’s Bham Bham bole in Indra. Sastry’s description of Lord Siva is great with words like Nippu, neeru rentini jataga nilipaavuga etc. Standout song in this hip hop album. Highlight of this song is remix of old song ‘Oho basti dorasaani‘ and Bhaskarabhatlas’s lyrics starting as choopulatone chunni laage jyaadu nuvveraa. Remix BGMs of old song in between interludes and using same tune with modern beat for ‘Barbee bommaki’ is done well. Standout song in this entire album is this one. It will be a silent winner in long run as its composition, lyrics, vocals are totally different from what we heard so far. Its a song that seperates this album from many recent albums released. Rahaman’s lyrics are superb, exploring all moods and ambitions of protaginist in this situation. Sreeram Chandra’s voice gives it a ghazal kind of feel and its something new to telugu music. Pawan Kalyan is an Addiction !